Ep. 7: Jamaya Moore – Pretty Much Beauty | Aimee J. Sometimes you don’t know what your dream job is until it jumps up in front of you. That’s the exact thing that happened to today’s guest, Jamaya Moore. Jamaya graduated college and went immediately into the corporate world. She was involved in high finance in a corporate environment and loved it. The things she learned, people she met, and skills she developed in that setting still benefit her today. But her dream was dormant, waiting for her, so to speak, and she didn’t even know it. When she agreed to help out with pre-ceremony tasks on a friend’s wedding day, her dream leapt to her attention as she watched the makeup artist do her magic. It was at that moment, witnessing what in her own words was a “transformation” of her friend, that Jamaya Moore knew she had to learn the art of professional makeup. 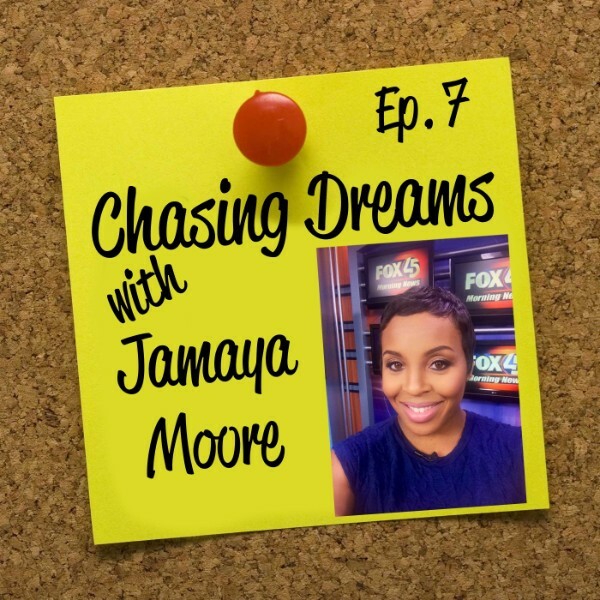 Hear Jamaya’s story on this engaging conversational episode of Chasing Dreams. You are the one who has to take steps toward your dream. Jamaya Moore’s dream made itself evident to her in a very unexpected way, but nothing would have happened from there if Jamaya didn’t take action. She immediately enrolled in a course to gain more skills in her newfound area of interest so she could learn and assess the opportunity. That’s what got the ball rolling and put her on the path to what is now a highly successful makeup artist business. Jamaya works for some big name companies as well as individuals, and has a reputation in the industry that is second to none. And it all began with her chasing her dream. Find out how Jamaya’s story has unfolded in this episode. Taking the leap to make things happen. Many people discover their dream, the thing that makes their heart race. But few people do something about it. Jamaya Moore is NOT one of those people. Once she discovered that the desire to become a makeup artist was exactly what she wanted, she did what she needed to do in order to educate herself in the field. But she didn’t stop there. After a 6 week training course she immediately started seeking out business on Craigslist, in local newspaper ads, and other ways. She wasn’t content to just get her feet wet, she dove all the way in. 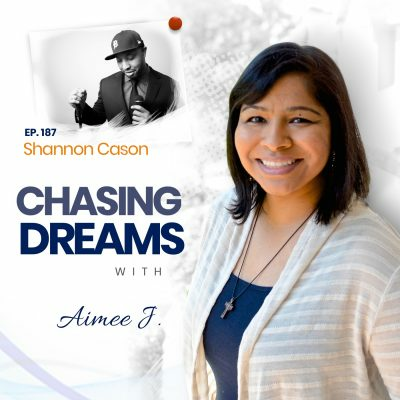 That’s what you’ve got to if you are going to chase your dreams, and Jamaya Moore is an inspiring example you can learn a TON from by listening to this episode of Chasing Dreams, with Aimee J. From a small solopreneur business to representing major clients and businesses. PETA, Christian Dior, MAC Cosmetics, Georgio Armani. These are just some of the clients that have tapped Jamaya to represent them in high profile places or campaigns. It’s a testimony of the amazing things that can happen if you’re bold enough to step out and take your dream seriously. Jamaya worked hard to make her dream come true and as you can see, she’s done exactly that. But she’s not finished. 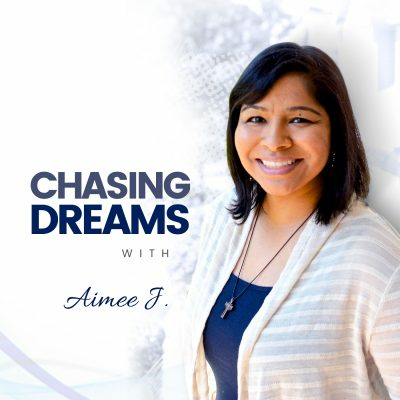 There are still additional things she wants to do, as would be true of any true “Dream Chaser.” Hear how Jamaya’s business is going and what she’s dreaming of that still lies ahead, on this episode. What’s holding you back from going after your dream? There were many points along the way when Jamaya Moore could have given up on her dream. At first, even her family told her she was crazy. Very few people thought she should pursue becoming a professional makeup artist. She even thought of herself as a tomboy… not exactly the mindset that you’d think would lead to being a makeup artist. And to top it all off, Jamaya had a great set of skills and good experience in the financial industry and could have gone back at any time. But it wasn’t what she wanted. She had a dream that she wanted to chase. So she did. What’s holding you back from chasing YOUR dream? Chances are that the things you see as obstacles are not as formidable as you think. Jamaya’s story could be just the inspiration you need to step out and begin making things happen. Listen in. You might be surprised what you discover in you. [1:16] Introduction of Jamaya Moore and her story of “jumping tracks” into a new career path. [2:00] How Aimee got in touch with Jamaya… the background story. [2:40] How Jamaya got interested in makeup and beauty and how she got there from a career in corporate finance. [5:04] How seeing a physical transformation in her friend drove Jamaya into an interest in makeup and beauty. [6:25] Entrance into “makeup school” and how it led down a new path. [7:51] The cost Jamaya was willing to pay in order to pursue her new dream. [9:06] How Jamaya jumped straight into her own business doing makeup for weddings and other events. [10:30] Looking for opportunities and the importance of networking and making connections. [12:05] How pursuing her dream enabled Jamaya to do the work without it being work. [12:59] From a startup business to representing big name brands. [14:11] Why Jamaya began her blog and the benefits it’s brought to her dream career. [15:41] How her makeup business became a 24/7 opportunity that she loves – and the addition of another company to her pursuits. [16:20] The variety of income streams Jamaya is providing. [17:31] How Jamaya’s opportunities came about in what she considers to be an “organic” way. [19:20] Did Jamaya see the life she’s living now back when she first became interested in makeup? [20:44] How Jamaya’s dream job came to her by surprise. [21:10] Ideas keep coming: Goals Jamaya has for future projects. [22:45] A list of Jamaya’s current clients: Some amazing names! [23:20] Jamaya figured it out: what that means for your possibilities. [25:01] The family thought she was crazy, but Jamaya went for her dream anyway. [26:08] Why Jamaya is incredibly happy with the way her life is today. [28:22] “All money is not good money,” a truth Jamaya lives by. [29:58] How Jamaya’s example shows the power of going for your dreams. [30:33] Aimee’s rapid fire game. [33:31] Aimee’s summary of the great conversation with Jamaya Moore. Aimee challenges Jamaya to the “rapid fire” game focusing on the subject of holidays. They will take turns stating a real holiday and the first to become confused, pause too long, or not be able to answer will lose the game. Who’s going to take the game?